A Samurai is about to execute some villagers, one can see this is a painful choice for him, still a Samurai must follow its master´s orders and if that includes a massacre, it shall be done. Hyakkimaru´s peace is broken when he can feel some ominious presence and disappear, therefore Dororo goes on his search. While searching, the young one finds, alongside Hyakkimaru, a horrible picture in front of him, a lot of dead bodies, those people weren´t part of an accident or attacked by a beast, no, someone slay them, the killer didn´t rob them, just murdered them and that was it. Dororo wonders who could do such thing? There, he finds a weird man holding a sword, his grey hair and the eyes of a madman, this person wants to feed the sword with blood. Suddenly Hyakkimaru start fighting that weird man! The fight is equal between both combatants, still the weird man say that the ability of his sword is better and the fight continues until Hyakkimaru, thanks to his prosthetic leg, is able to pull the sword away from its user! The man falls from a cliff and Hyakkimaru decides to stop searching for him, Dororo comes and gives him his prosthetic arm, but the leg is still missing, so he goes for it. The girl starts remembering the time when her brother departed, he said that as a Samurai he has to follow his master to war, still he will make sure to come back. The man has woken up and she is taking care of her brother. Back with the little one, he goes to the scene of the battle and finds the leg, he tries to pull the sword of and throw it away, but when he touches it, this weapon stick to the hand of the kid, the power of this weapon is moving his body, Dororo tries to fight, but the influence is too high. Soon Dororo find some travelers and tries to attack them, but the own will of the young one prohibits the sword to actually hurt them, the travelers yell that he is a ghost or some kind of supernatural being, Dororo then start walking towards the town. The man is remembering that fateful day, the day when he was brought to that sword, he was a Samurai, his master ordered to make a new castle, an imposing one, one that can defend him, one without weaknesses, after the work was made, fearing that the workers might betray him, he gives the order to the man, Tanosuke, he has to kill each and every one of them. Tanosuke begs for the life of the workers. The lord then say that if he can´t kill them, then he must take his own life, he gives him a rusty old sword. Tanosuke takes it, and afraid of losing his life decides to kill the workers beheading the first one, it wasn´t a clean cut, the rusty sword wasn´t sharp enough so he had to keep smashing the blade until the head fell from the body. The lord laughs while saying that this sword is supposed to be cursed, one that sharpens with the blood, of course he doesn´t know if its true. Tanosuke looks at his master with crazy eyes, he has been taken by the sword and mercilessly kill him. That way that man started searching for more blood for this weapon. In the present, the lady has brought her brother home, she has some food for him, is not much, but its his favorite, she begs him to come back home, to start again, but the man is very distant. She remembers that when she was small and started crying, the only way she was able to stop crying was when he gave her an origami figure. Still the man was just silent and can feel the sword drawing closer and closer. The man wants to go and take his sword back, but Osushi, his sister, embrace him and tells him to not to go, still Tanosuke don´t listen and she starts crying, he push her to the ground and Osushi starts lamenting her fate, she has lost everything, she couldn´t protect her land and now…That her beloved brother is here, maybe, she can make things right and restore, even if a little, the life they had. The lady got distracted and before she knew, the man had left, leaving just a paper crane. Dororo is walking on town, resisting the impulse of the sword. It is not until he finds Hyakkiamru who starts attacking the little one, after some attacks the Ronin is able to pull the sword away from the kid. The sword then will be held by Tanosuke, the fight between those two resumed and started fighting again, the Sister is able to witness it, she begs them to stop, but her words fell on deaf ears. In the end, Hyakkimaru kills the man and breaks the sword… The lady starts crying. Soon Hyakkimaru´s ears start rising and he can now hear things, the sound of the rain and the laments of the lady whose brother is now dead. In another part, the Daimyo is at the hall of hell, he is not happy with these changes. An amazing chapter! 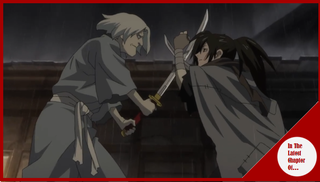 While the characters presented on this chapter that weren´t Hyakkimaru and Dororo will most surely won´t appear again it was still enough to make them memorable and to make an impact to the viewer. I mean the pain of the lady was something crushing and so was the degradation of her brother and how he ended up being a slave of the cursed sword, but still some signals of a redemption, redemption that sadly won´t ever realize due to how the things ended for him, and that is a tragedy that makes some good and weird taste in my mouth. From the side of Hyakkimaru, we are seeing how he is getting more and more of his senses back, but also that he cares for Dororo since he made sure he won´t hurts the kiddo. Finally, one can see that Hyakkimaru is rustling the feathers of the Daimyo, so we will see if he makes a move about him!